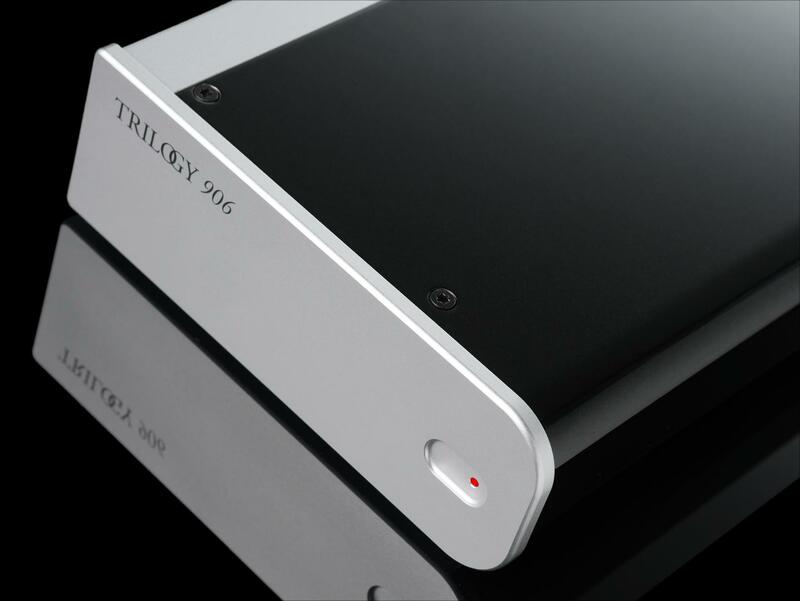 We loved the Trilogy Audio Systems 907 phono stage when we tested it in issue 85. But it is a bit ‘spendy’. So when we saw the 931 headphone amp (a stripped down version of Trilogy’s top 933 model), we hoped there might be something smaller, lighter and cheaper than the 907 in the pipeline. There was, and it’s called the 906. Trilogy doesn’t really go in for funky names. As with the 931 headphone amplifier, the 906 phono stage incorporates a lot of what goes into its bigger brother, but in a single chassis. There is a likely a performance boost in going for the original 907 model (enough to justify the £1,000 price differential), but the 906 never once sounds ‘cheaper’. Trilogy came up with a smaller, simpler chassis in the 931 headphone amp, and the same casework is used here. This not only keeps cost down, but includes a folded top and side plate that allows the 906 phono stage to come in one of at least three colour accents; silver as standard, dark grey (Nero Carbonio), and a fetching shade of mid blue (Mediterraneo Blue) as standard options, and a wealth of colour options to special order under Trilogy’s ‘Chameleon’ paint finish system. The standard three finishes match – and two contrast – the silver of the front panel and side cheek. The 906 is extremely configurable, although it eschews the ‘on-the-fly’ adjustment of models like the Cyrus Phono Signature. Instead, a six pole block of tiny DIP switches on the baseplate of the unit can be used to adjust the phono stage. The first switch in line moves between moving magnet and moving coil. The second and third adjust capacitance, while the last three alter the resistance setting. Notionally at least, you could adjust these while the 906 is still connected to the power, as long as you mute the input of the amp to which the phono stage is connected. In reality, you will probably power it down, adjust, and power it up again. The switches do allow a surprisingly wide range of load settings, but unless you are in the habit of playing ‘guess the capacitance’, you are best served consulting the manual. There’s arguably not much more you can put on a phono stage at this level, but the 906 is minimal in the extreme. There’s a power light on the front. End of paragraph! If you want a phono stage that can switch between cartridges, support a wide range of pre-RIAA curves, includes legacy rumble filters, and the rest, this isn’t your phono stage. As I said, there’s a power light on the front.